Watch highlights of the Scottish Premiership match between Hibernian and Dundee United. 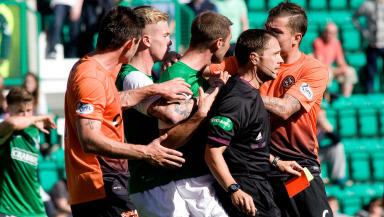 Tempers ran high at Easter Road as Hibernian picked up their first point of the campaign courtesy of a 1-1 draw with Dundee United. The home crowd, unhappy with the team’s displays under Pat Fenlon, had more cause for concern when Stuart Armstrong gave United the lead before the break. Full-back Frazer Mullen was withdrawn after a crude challenge on Gary Mackay-Steven with Ryan McGivern coming on. Both sides were reduced to ten men just after the hour when Kevin Thomson and Gavin Gunning clashed following a tackle from the United defender. 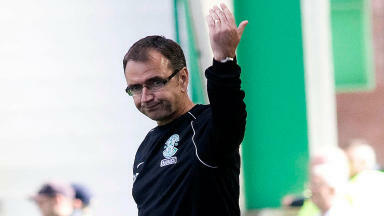 It sparked a brawl between both sets of players and seemed to give Hibs some life. Scott Robertson remained alert after his first shot was blocked and he fired in the rebound for a goal against his old side. Read a full report of Hibernian 1-1 Dundee United.